"Linens Included" terms: Bed & bath linens are included for any 7-night rental in 2019! Includes linens for all beds. 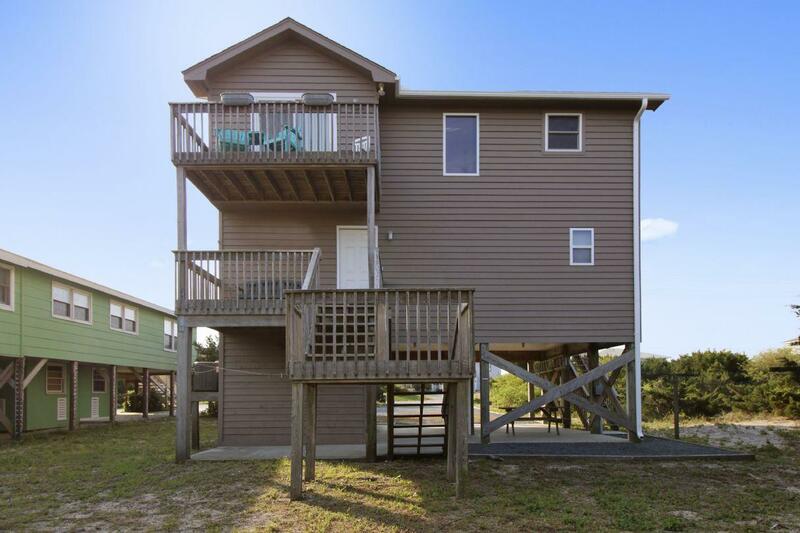 "Moonlighting" is a beautifully appointed four bedroom, two and a half bath house sitting directly across the street from the beach and sleeps 11. Enter the house on the first floor through the covered front entry porch and experience three of the four bedrooms this property provides. The master bedroom is the Southernmost bedroom and has a king bed, flat screen TV, private bathroom and access to the lower deck. The second bedroom offers a queen bed and access to the lower deck through the sliding door. The third bedroom, with a twin double bunk bed with a twin trundle, sitting area for the TV and lower deck access, s perfect for the little ones or teenagers in your group. A shared full Bathroom is at the end of the hallway and laundry area is conveniently located on this floor as well. Upstairs on the main floor lies the living quarters and fourth bedroom. The main living area boasts a fully equipped kitchen with a great island containing bar seating; this area is great for keeping the cook company. The provided water filtration system means there's no need to bring extra bottles of water! A large dining table, accommodating eight, offers a great place to dine while taking in endless ocean views. The living area is centered with sliding glass doors out to the upper deck stretching the length of the house. The living area has a comfortable couch sleeper sofa with love seat, chairs and a large flat screen TV with Roku. Beautiful hardwood floors grace the upper level. The fourth bedroom, located off the living area, features a double bed and private deck access. A half bathroom is located in the hallway accommodating the main living area as well as bedroom four. 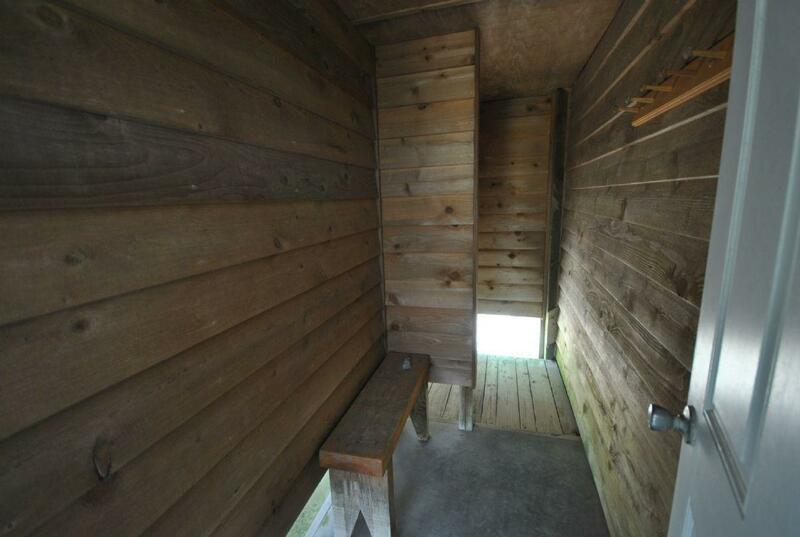 This house has a fantastic enclosed outdoor hot/cold shower for washing off after a day at the beach. There are also numerous beach essentials available for guests in the storage area. Enjoy grilling out and gather around the picnic table located in the covered parking area underneath. From the decks, you have a great view of the ocean and beach located directly across the street with the public beach access. Don't forget your paddleboard; access to the sound is only a short walk away! Let "moonlighting" light the way to a relaxing island getaway! "Loved sitting out on the deck on those brightly colored chairs and listening to the waves rolling up on the shore! Bright, clean and comfortable accommodations. Easy in and out. 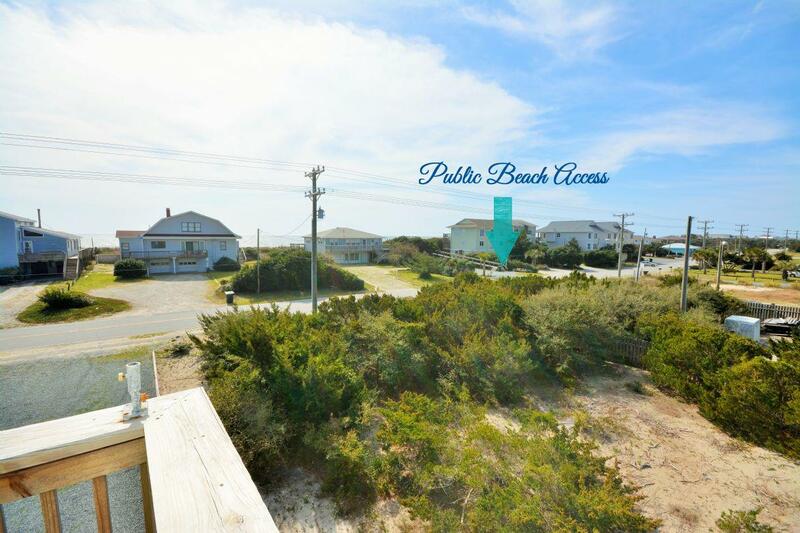 AND the public access to the beach is right across the road!" "Really nice, everything we needed was there. Enjoyed the location and views. Bed on top floor not so nice! But, would recommend!" "Location was great and loved the double balconies." "Well maintained and clean. Plenty of space for us"
"It was very relaxing. We only stayed for the weekend but wish we could stay the whole week!"